Activist Piyush Manush, part of the Salem Citizen’s Forum, was arrested under charges of criminal intimidation when he chained himself to a road-roller on Friday to protest the construction of Mulvadi bridge. On July 15th after meeting him in jail his wife was so upset because he told her he was being slapped and hit – but only when lawyer Maayan met him he has told him that he has been beaten badly by over 30 people – kept in solitary confinement and in dark rooms. Manush chained himself to the road-roller along with two others as the first day of construction began for the Mulvadi bridge. They alleged that due procedure was not followed. Swifter than ever, the police reached the spot and arrested them under three charges – disobedience to order duly promulgated by public servant, Punishment for wrongful restraint, wrongful confinement and criminal intimidation, a non-bailable offence. The Mulvadi bridge will be built over a railway crossing, but will only allow one-way traffic. Manush and the forum suggested an alternative that will allow two-way traffic. Those of you who know Piyush and his work already can appreciate how many “powerful” folks he would have antagonised through his selfless work. You will also remember how he was the first one to jump in to create bamboo rafts by spending sleepless nights to save floods-stranded Chennai citizens in that recent disaster. He is also well known for his work on lake revival and protection in Salem amongst many other causes. National Alliance of People’s Movements (NAPM) condemns this complete arbitrary arrest of environmental activist Piyush Sethia, who has been a crusader for several national level issues including Bhopal Gas Survivors, rights of adivasis and founder of Salem Citizen Forum. He has worked hard to change the face of the city Salem by organising citizens led efforts to revive lakes, forests, wet lands and so on and is know for his work of promoting alternative handicrafts and creating environmental awareness. His arrest on completely false charges can only be termed as political vendetta and an action by disgruntled officials who have been irked by several initiates Salem Ciizens Forum has taken over years now. It’s condemnable that he is being tortured in the prison and his bail plea too has been rejected on not tenable grounds, while other two arrested along with him as has been granted bail. NAPM is writing to Chief Minister of Tamil Nadu demanding immediate release of Piyush and demands action against the officials who are guilty for not following the law and also for inflicting torture on Piyush. We stand in solidarity with Salem Citizen Forum, Piyush and his family in their struggle for the rights of the people and against environmental destruction. We write as concerned citizens and environmental justice activists in support of Piyush Sethia of Salem, Tamil Nadu who has been arrested, denied bail and beaten inside Salem Central prison. Piyush is a noted environmental activist of Salem Citizen’s Forum (SCF). He has been booked under IPC sections 341,188, 353 and 506 (2). On 8.07.2016, when Piyush and other members of SCF were protesting against the railway authorities for starting the construction work of Mulvadi gate over-bridge in Salem without giving prior notice to the people in the area and without laying an alternate road, police arrested Piyush and two other activists, Eesan Karthik and Muthu of SCF. On 14.07.2016, the Salem Magistrate’s court dismissed Piyush’s bail application while granting conditional bail to the other two activists. Piyush has been kept in solitary confinement since the day of his arrest. And as per Piyush’s wife and his lawyer, Piyush is being subjected to physical and mental harassment and not allowed to receive reading material or allowed to speak to his wife and other supporters freely. Infact, some of the supporters in Salem are being intimidated and threatened via phone calls to isolate Piyush. According to Piyush’s lawyer, Piyush was beaten ‘for a good half an hour before they sent him to solitary confinement’. Yesterday Piyush informed his lawyer that ‘he was abused by a group of unknown persons numbering nearly 30 inside the prison several times’. We are shocked at this high-handedness of prison authorities and custodial assault on Piyush. He leads Salem Citizens Forum to revive many water bodies in Salem city like Mukaneri,Ammapettai eri Kundukkal eri, Ismailkhan eri, Arisipalayam Theppakulam and Pallappatti well. He has created a co-operative forest in Dharmpuri extending upto 150 acres, with the support of his friends and well wishers. This mountain forest acts as a water catchment area for Ettimarathupatti Canal which supplies irrigation water to 17 villages in the vicinity. He has led many citizens’ initiative to protect the natural resources of Salem and its surrounding areas. He has also initiated many green and sustainable livelihood projects and protected the Salem, Yercaud and Hoggenekkal Dam areas from environmental damage. In the recent floods of Chennai and Cuddalore, Piyush and members of SCF, Nizhal and Dharmapuri People’s Forum mobilized 35 containers of relief material and tirelessly worked to reach the materials in time. This won Piyush a CNN-IBN award recently. 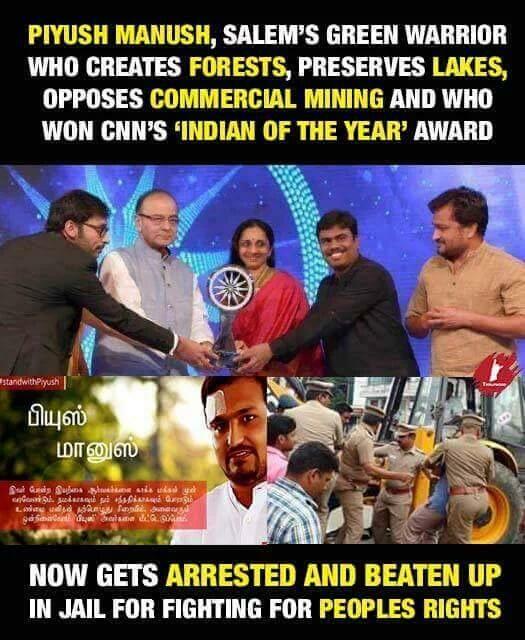 He was also named as one of the advisors of Nilam, Neer, Neethi (Land, Water, Justice) initiative of Ananda Vikatan group which was kicked off following the floods to protect water bodies in Tamil Nadu. Immediate release of Piyush and all charges foisted against him and other activists be withdrawn forthwith. Such severe atrocities on innocent humanbeings meeted out by state& obnoxious police is highly condemne& we urge for Mr Piyush to be released forthwith….. Activists fighting on behalf of oppressed people are being harassed by governments. This is intolerance and trampling if fundemental rights of the people. He should be released immediately.